The first year of the Kelley School of Business Online MBA program features 27 credits worth of classes. For students starting in the fall, the first elective in the online curriculum begins during the summer semester, while those who opt to start during the spring will not take any electives until the following year. Regardless of which cohort online students begin in, each schedule features classes in information technology, economics, quantitative analysis, accounting, strategic marketing management, operations management, and financial management in the first year. In the second year, students must select one of the following three course offerings to satisfy the business law requirement: Law and Ethics in Business; Managing Intellectual Property in a Global Environment 3.0; or Law for Global Business 3.0. Each of the three courses available may start at different times of the academic year. While earning the Kelley Online MBA, students also have the option to earn an additional Online MS in business analytics, entrepreneurship and innovation, finance, global supply chain management, marketing, or strategic management. This will require an additional 12 credits worth of coursework. There are 934 students enrolled in the Kelley Online MBA program, with 73.6 percent male students. The average age of enrolled students is 31-years old, the average GMAT score is 638, and the GPA is 3.4. The most recent class’ reported average salary after graduation was just north of $107,000, representing a 28 percent average salary increase over pre-MBA salary. Around 65 percent of graduates earned promotions while earning their Online MBA. Tuition for the Kelley Online MBA program is $1,330 per credit hour. Over the course of 51 credits, that total comes to $67,830. The average cost of material per course is $100, and there is an additional $30 per credit hour fee. Combined, this raises the cost of the 51-credit program to $74,460. For those students who choose to pursue the optional dual Online MBA/MS, this raises the total cost to $91,980. The Kelley Online program offers numerous merit-based scholarships awarded for academic performance, GMAT scores, professional work experience, and overall strength of a candidate’s application. Students are eligible for federal financial aid through the FAFSA program. As well, military service members and veterans may be given additional financial support through the U.S. Department of Veterans Affairs Education Service, Indiana Department of Veteran Affairs, and the Veterans Affairs Vocational Rehabilitation and Employment. 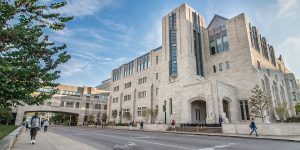 Along with a $75 application fee, applicants to the Kelley School of Business Online MBA program must submit GMAT or GRE scores, although these may be waived under special circumstances. As well, students must submit official school transcripts of academic records, one letter of recommendation, a 500-word personal statement, and a resume. Students may be invited to take part in a 30-minute phone interview with the school admissions team. International students who were either born in a non-native English speaking country or have not earned an undergraduate or graduate degree at an English-speaking institution may have to provide either TOEFL or IELTS test scores to prove English fluency.